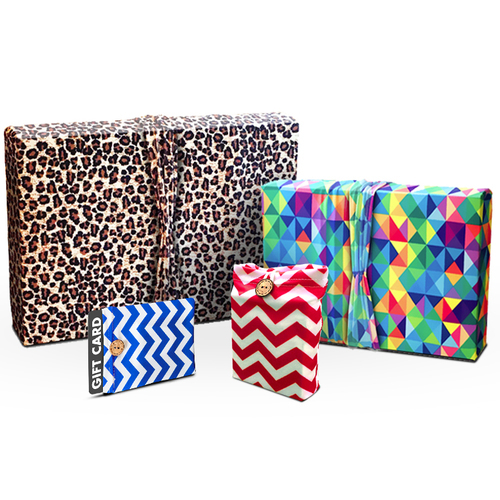 Top Notch Material: Wrapeez: Makes Holiday Wrapping a Breeze! Wrapeez: Makes Holiday Wrapping a Breeze! I am not really big on wrapping presents. It definitely is not my favorite thing, and I am not one who takes pride in my beautifully wrapped gifts. I usually opt for gift bags, but now Wrapeez has made my wrapping so pretty!! Now things will look perfectly and professionally wrapped, without all the work. Quick, easy and reusable, our patented Eco-friendly gift wrap stretches over different shapes and sizes. Fashionable patterns with a built-in bow effect creates The Best Dressed Gift every time! Hurry and get yours now in time for Christmas, and make your life so much easier! Now we can order everything online and wrap easier...the Holidays are a breeze....almost.